At Café La Fortuna, John and Penny Bohnen, owners of County Line Properties, and their daughter Courtney Bohnen Stach, one of the office’s top agents, take a rare moment away from work to grab a cup of coffee. Soon after hanging her shingle, Penny’s husband John joined the company. A lifelong Hinsdalean—five generations of his family have lived in the area—John’s past career life in construction gives him a unique perspective on the local real estate market. “We’ve been involved with the community for so long that we can help people hit the ground running when they move here, way beyond just where they are going to live,” John says. 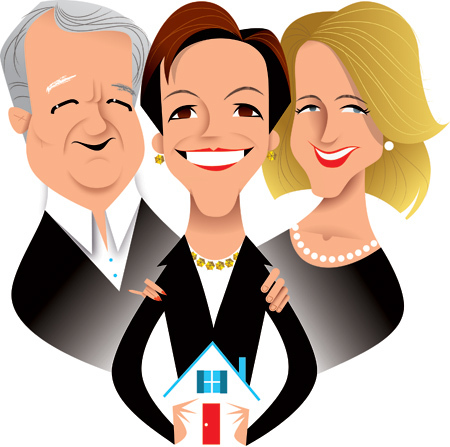 John and Penny have lived in a historic Hinsdale home on E. First Street for more than 40 years. It was the boyhood home of Paul Butler, the founder of the Village of Oak Brook. Their three daughters—Courtney, Stephanie, and Ashley—all grew up there and now have children who love to play in their grandparents’ home. If those walls could only talk, we are certain the stories would be fantastic. John and Penny’s love for Hinsdale and its charm are at the foundation of their real estate business. “One of the nice things about being a boutique office—not part of a franchise—is that we get to represent quality products,” John says. “All things great and small is how I like to think of it,” adds Penny. When County Line Properties first opened, they refused to hire anyone from a competing office. Instead, they hired people new to real estate and trained them in the County Line way. Today, the office has 36 agents (all of County Line’s agents are local residents, most of whom have been with the company since its inception; the Bohnens consider them part of their extended family)—their daughter Courtney, among them. “I’m kind of like that prodigal son, except I’m a girl, who came home to help with the family business,” Courtney says. After earning her stripes in corporate America, Courtney joined the family business after September 11, 2001. Courtney, who lives in Clarendon Hills, represents a growing population of people moving from the city to Hinsdale and the surrounding suburbs. “We’re selling homes, not houses. When we’ve done right by our clients, we’ve done a good job,” says Courtney.